At the site of the old Cornucopia Deli, nestled quietly under Central Square in Bristol, NH is Shacketts Brewing Company, established in 2014. 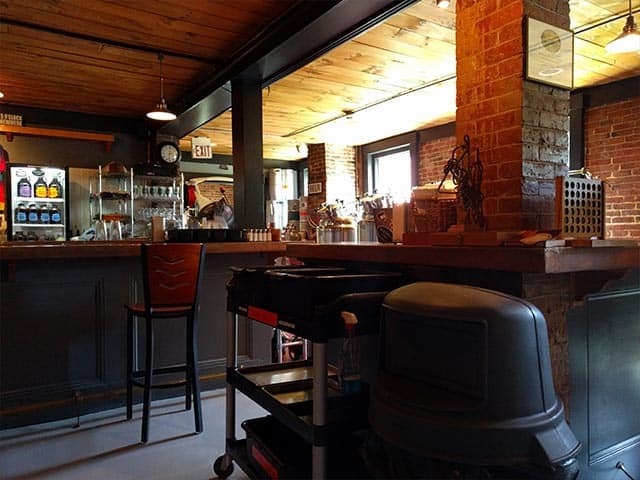 With good beer, a great space, and excellent prices, Shacketts does the Lakes Region proud. The place is overloaded with ambiance, with mill building brick, plenty of light from the windows in the back, and large sacks of grain laying around. It even has a dog roaming around. 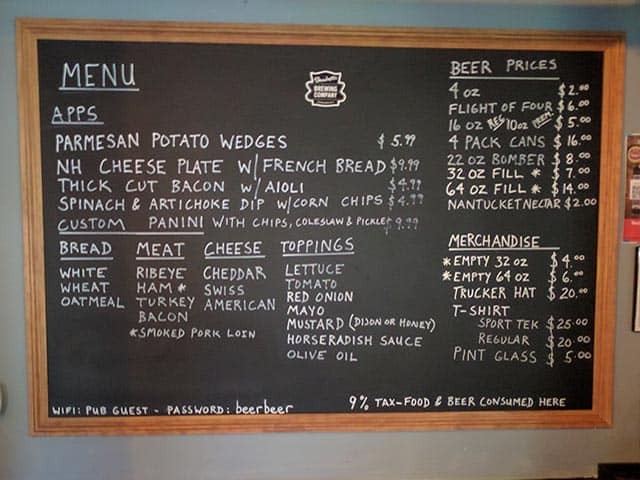 Custom-made sandwiches and bacon to eat. The sounds of a river rushing by. I don’t think so. All of the barrels are laid out in front you to the side of the bar. So, if there was an official tour, it would be pretty short. 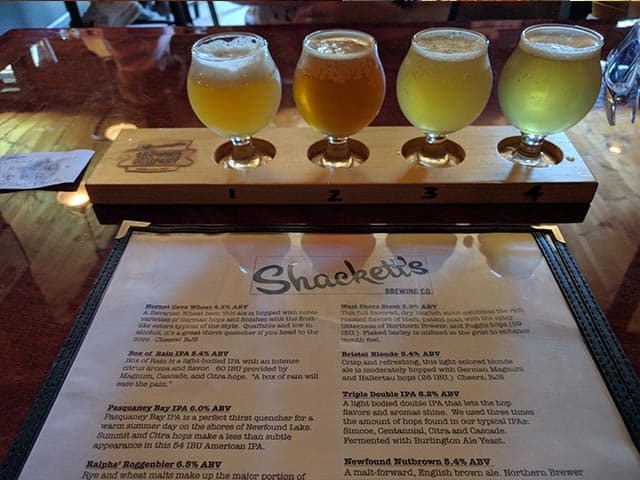 What types of beer does Shacketts Brewing Company brew? A variety of types. Got the Hornet Cove Wheat, the Box of Rain IPA, the Pasquaney Bay IPA, and the Bristol Blonde for my flight. Next time I will have to try the Newfound Nutbrown, the Triple Double IPA, the West Shore Stout, and Ralphs’ Roggenbier. Not sure. They did have three IPAs on tap when I went. Flights and growlers are a yes. You can buy 22oz bombers and 32 and 64oz growlers. Does Shacketts Brewing Company offer food? Yes. Had just come from lunch at Walter’s Basin so I didn’t order any food. But, you can build your own sandwich. Better yet, they have parmesan potato wedges. Gonna have to get the thick cut bacon with aioli next time for sure. Darts, a wooden Connect Four set, sand shuffleboard, Cribbage, a deck of cards, and checkers/chess. Not to mention the guitar on the wall that may or may not be available to the public. Where can I buy Shacketts beer in stores? I would assume in Shacketts market, amongst other area stores. The Newfound River running behind the brewery was a wonderful addition to the atmosphere of the joint. Who doesn’t like the sound of a river? Shacketts is the only taproom/microbrewery that I can remember being dog friendly. A huge plus for dog-owning beer lovers. On the other hand, parents beware, the taproom didn’t have a baby changing station in the bathroom. Definitely going back at some point. The taproom itself has everything.